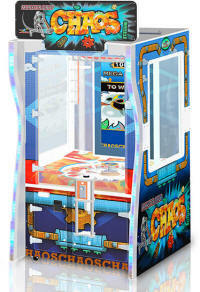 Benchmark Games proudly announces ACME CRANE COMPANY, a truly innovative crane game that propels the time-proven crane concept to new levels of excitement and profit. ACME CRANE COMPANY adds exciting new dimensions to the familiar crane gameplay concept. Fun soccer themed version! Get past all the soccer player defenders and the Goalie for a GUMBALL GOAL! Big Rig Truckin' comes in a two-player flashy cabinet with a large colorful backlit marquee. The new stimulating sound system has separate audio controls for both the play mode and the attract mode. Players will be trying to fill the truck trailers with coins because every coin into the dump truck wins tickets. 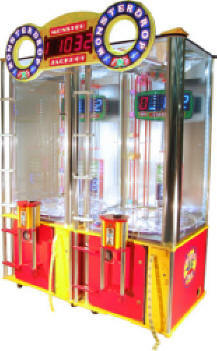 Players who hit the Dump Lever win multiple tickets for every coin dumped. Jackpot targets around the trailers award hundreds of tickets if hit and help re-seed the trailers for the next Big Dump. Aim and fire the "BLASTER" to propel "CRYSTAL" Cannon Balls toward lit targets. Some targets award an extra shot! Brightly lit with LED lighting, Blaster will draw players of all ages to play. Blue Blast! / Blue Blazes! Exciting design abounds with motion, vivid lights and rip-roarin' sound effects! Intense one and two player hoops action! Liable design for quick packing and transportation. Linkable up to 8 machines for engaging player competition. Swing hoop. Foldable design for quick packing and transportation. Unleash . . . CHAOS! Here's a new and EPIC entry in the wildy successful MONSTER DROP family, CHAOS, which takes the skillful ball drop game to a whole new level. Time the ball drop through a CHAOS hole on the wheel and unleash a cascade of 16 bouncing balls for a wild scoring bonanza! COIN FLIP challenges players to walk their coin down the rotating playfield towards one of eight notches. If the player times the coin drop right, the coin will literally "flip" into the notch. "Flipping" a coin into the Jackpot Bonus will trigger a secondary community bonus where all players in action may benefit from bonus tickets. Coin Flip is a 4 player game in a compact and brightly LED lit cabinet. Introducing Dragon's Claw, a skill crane which features a fierce dragon with piercing eyes, and a menacing, swinging claw that vigilantly guards its treasure trove while perched upon an 11' tower. Finally... the game that'll BLOW UP your cashbox! Player stops the LIGHT WHEEL on INSTANT POP or on values that CRANK the AMAZING AIR PUMP and PUMP the BALLOON bigger and bigger until it contacts the SPINNING SAW BLADE below and POPS! Spine tngling anticipation pays off with a loud exciting POP that keeps players running to play! 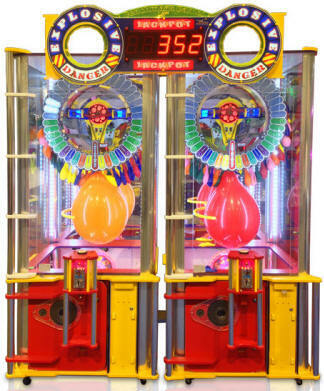 Tickets pay out with the pump zones and popping the balloon pays out the AMAZING 2-Player JACKPOT! 7 of your choice wins Jackpot! Win Tickets for your Targets! The NEW! Fireball boasts a new skill stop feature that allows player to both stop the wheel and then time ball drop – and vice versa. This allows the player to both manipulate the playfield and the ball drop- skillfully giving them more control over game play and ticket values earned. Add one more to BENCHMARK GAMES' long string of successes: GOLDZONE's unique skill-based gameplay concept is reminiscent of pushers, but reaches all new levels of skill, challenge and PROFIT! As the coins/tokens pile up, the inevitable result is FAST coin play. If a ball drops in an ADD BONUS BALL hole, balls are reserved until, if you make it in a DROP BONUS BALLS hole, it’s a MULTI-PLAY extravaganza! The X-TREME of all X-TREMEs! 13.5 ft tall (adjustable) and 9'3" wide, Monster Drop X-treme is sure to be your BIGGEST ATTRACTION! Bounce a ball up onto the platform and into the MONSTER JACKPOT hole and win a huge 2-player cumulative JACKPOT! POKERKARD™ is a new 1 to 4 player amusement-only touch screen cocktail video game featuring Texas Hold 'Em Poker. It’s a seated or stand-up game and there is no gambling involved. POKERKARD™ is based on the "Play For Fun" ethos - players get to kick back and enjoy pitting their poker skills against friends and strangers alike -- and everyone gets to leave the table without losing the shirt off his back! Pop the balloon to win! Player uses Stop Button to hit POP BALLOON position on the spinner. WIN ZONES award tickets, but ADD AIR ZONES also inflate the balloon. Ticket value accumulates until popping the balloon pays out the Jackpot Value! THIS GAME EARNS MORE THAN ANY PREVIOUS BENCHMARK GAME EVER HAS! Eye-Popping 11 foot tall cabinet! Players use the Stop Button to hit Pop Balloon positions on the Spinner. Win Zones award tickets, but "Add Air" zones also inflate the Balloon. 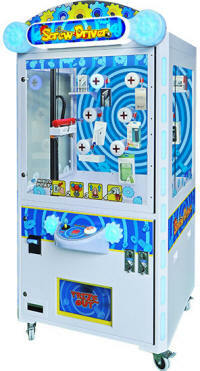 "Instant Balloon Pop" feature- hit the target for instant Jackpot winner, with exciting sound and lights display! 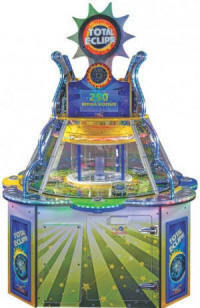 High-earning, skill-based balloon pop game, Players stop the spinning light to land on values that crank the air pump to inflate a balloon with each play, The game objective is to inflate the balloon to strike the Spinning Saw Blade for tickets and game celebration component- a resounding POP!, Players can “pump up” the number of tickets won by stopping the light on “Instant Pop” to activate progressive Bonus ticket feature. Power Drop X-TREME: X-Treme Play, X-Treme Profitability. Un-Leash the Beast and Watch Your Profits Run Wild! Red Hot's exciting single player design abounds with motion, vivid lights and rip-roarin' sound effects! Targets award tickets! Six Reds wins Super Jackpot! Blue targets win Mystery Bonus! RED HOT! X-TREME 7's Bigger & Hotter than ever! RedHot! is exciting, but RedHot! X-Treme 7's is tremendous! 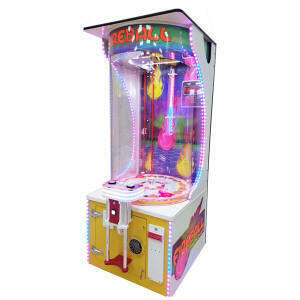 Its action-packed motion, vivid lights and rip-roarin' sound effects will fire you up! Seven Reds wins Super Jackpot! Blue targets win Mystery Bonus! Convenient Pullout Ticket Drawers which hold up to 36,000 tickets. Easy access via large swingout door. ROLL FOR GOLD 2 updates the timeless big earner with the look, sound, and excitement of a hot rod at a classic diner! The bold hot-flames design, powerful L.E.D. light show, and “modern nostalgia” soundtrack are a player’s delight! It’s a premium Redemption game at an affordable price and will earn and earn for years to come. AIM to UNSCREW a SCREW and DROP A PRIZE! You don't need to be a carpenter to play this exciting new merchandiser. You don't even need to bring your tools. Just bring your skill to unscrew the Phillips head screw and drop your prize! Falling, Falling, Bouncing, Bouncing, Win Tickets and/or Prizes Everytime! 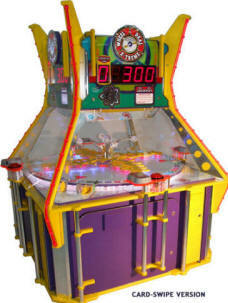 Hit the Slam Button and release a high energy ball aiming at holes in the spinning horizontal wheel. Time it right so it falls through bonus target & win extra ball holes and/or mountains of tickets! If you're looking for something REALLY BIG for your establishment... a BIG ATTENTION GETTER and BIG PROFITS, you can't overlook Benchmark Games' SLAM-A WINNER X-TREME. Hot on the heels of the wildly successful original Slam-A-Winner, this amazing 11-ft tall version is sure to draw big crowds. The original Slam-A-Winner has proven to be one of the biggest money-makers of all time, the #1 earning game in America and the world. Now watch as the SLAM-A-WINNER X-TREME takes this phenomenal success to NEW HEIGHTS! The player hits the Slam Button, timing the release of a high energy bouncing ball to fall through targets for points or bonuses. Near misses careen and bounce around the playfield before dropping into a hole. Win mountains of tickets! Play multiple balls in rapid-fire fashion. And it's a winner every time. Dynamic sound effects, flashing lights and rockin' music keep the excitement level as Big as the game! Maximize your room's spectacle in a minimal floor space, as long as your ceiling is high enough, that is! You can even customize the marquee with your own logo. SPINDROME is an intergalactic themed spinner inside a brightly LED lit mind-blowing big dome and 1 to 3 target arrows to choose from. Players grab the "play handle" and give the wheel a spin to skillfully aim for big ticket values! 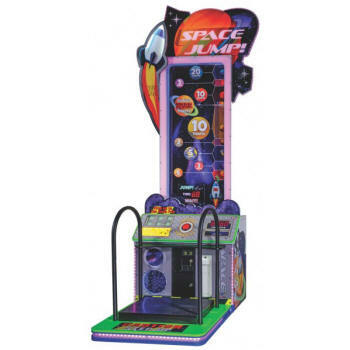 Pick-up profits and take revenue to the hoop with this street basketball themed skill crane! 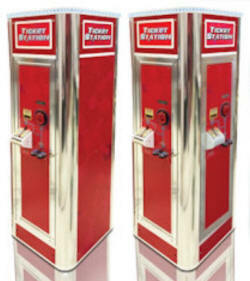 Display your high dollar merchandise, and watch this machine become a center of attention in your location! Spin the Wheel to skillfully time the Sweeping Arrow to land in glowing big ticket value zones! Cascading LED lights and a pulsing soundtrack elevate the excitement to staggering heights! Prints receipts on high quality Seiko printers for smooth, fast operation. Features include password secured accounting, custom marquees, self cleaning, redundant reliability, self-destruct protection, scissor cutters and more. 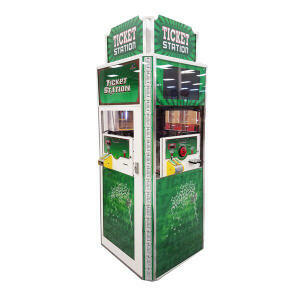 Introducing our newest Ticket Station! It retains all the capabilities of our current model but also has NEW FEATURES! 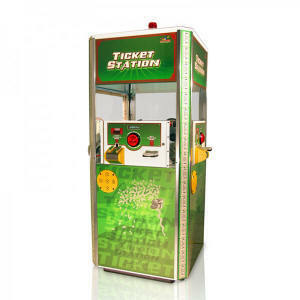 Players insert tickets to be counted, then receive a receipt indicating the ticket count to present for redemption (at the redemption counter or at a Tickets to Prizes self-contained redemption machine). 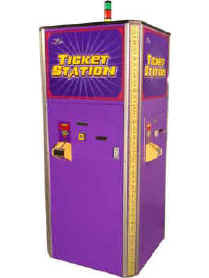 Players insert tickets to be counted, the receive a receipt indicating the ticket count to present for redemption (at the redemption counter or at a tickets to prizes self contained redemption machine. Self-contained redemption center, for unattended and attended locations! 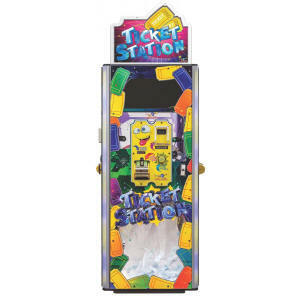 Insert tickets and select a prize. Holds 1200+ prizes! Buy additional tickets as needed. Unused tickets are refunded! Self-cleaning feature: high-pressure air blast every 1000 tickets keeps optos dust free! Feed in tickets, select a prize. Counts tickets, awards prize or prizes. Backup your counter during busy hours, save on personnel during slow periods, and convert a non-Redemption room into a high-earning redemption room! 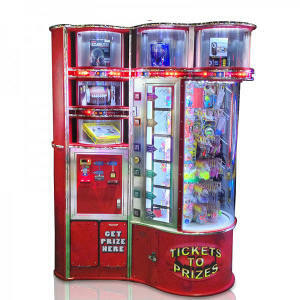 Holds small (1,400 selections) to medium-large prizes (107 selections), using a patented rotating display and has seven brightly-lit featured prize compartments. Our patented Single prize tree offers your customers hundreds of prizes in a small footprint. It holds 840 small prizes to 65 medium prizes selections and with brightly-lit feature prize compartments. Console-style set up keeps one customer in charge of scanning, selecting and retrieving prizes, with an easy view of all prizes from a central location in front of the machine. Single prize tree version offers a smaller footprint. Holds small (840 selections) to medium prizes (65 selections) and has five brightly-lit feature prize compartment. 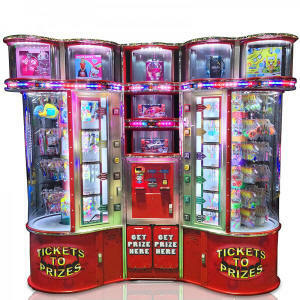 Its console style configuration offers one customer simplicity in scanning, selecting and retrieving prizes, with an easy view of all prizes from a central location in front of the machine. Increase your game room revenue and maximize payroll with our unmanned redemption solution! Now with new easy access door! Now with new easy access door! and turning along a cosmic pathway onto the spinning wheel, landing dead center on celestial WIN ZONE TARGETS (SUN or STARS) and winning indicated ticket values! center to win ticket values of extraterrestrial proportions, or the cumulative MEGA BONUS! Centerpiece cabinet style with modest footprint. Rotating marquee! Ethereal LED glow light effects and interactive monitors. Out-of-this-world audio package with themed sounds and player prompts. Subwoofers for superior sound quality. Card swipe capable, Intelli -Triple Dispenser for each player station. 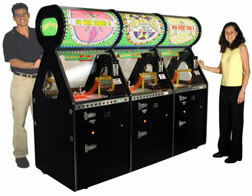 WHEEL DEAL features 1,2, or 3 thrilling game stations each with its own spinning wheel and unique jackpot values. Players get to test their skills by dropping either coins or tokens down a brightly colored ramp in an attempt to land in the specially marked WIN ZONES. There's also an exciting 4-digit Jackpot at each of the stations. It's time to take top-earning WHEEL-DEAL to new X-tremes! With a HUGE centerpiece cabinet & mind-bending lights & sound, it's quite simply the coolest, wildest, most sensational X-TREME attraction you've seen in years! 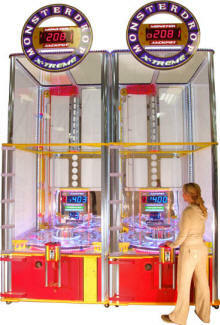 Players skillfully aim to drop six balls into “White Hot” targets on spinning wheel to win tickets. Blue targets win Mystery and Six Flaming White Hot Win Cumulative Super Bonus! Nostalgic graphics, classic cabinet design and vivid light effects.